One of Mull’s better known visitors was Dr Samuel Johnson who came with his travelling companion and biographer, James Boswell in 1773. Their visit was recorded in the diary written by Boswell and from which Mrs Eckstein quotes extensively (Historic Visitors to Mull, Iona & Staffa, Excalibur Press, 1992). It is reported that both Johnson and Boswell had read Martin Martin’s earlier book (A Description of the Western Isles of Scotland ) and they brought a copy with them on their journey. 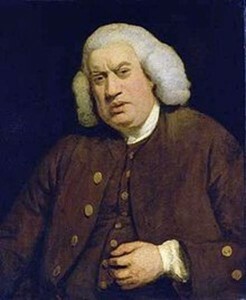 Johnson felt that Martin’s report had failed to accurately record many of the interesting aspects of life at the time, suggesting that this was due to the fact that Martin was unaware of the acute differences in the social structure of the Western Isles compared with the ‘modern world’. Johnson and Boswell arrived on Mull after visiting Coll with the aim of getting to Iona since Boswell had set his heart on visiting the island. The two spent a short time in Tobermory, at Erray House, the home of the Maclean family, before continuing their journey. Mrs Eckstein suggests that they were unable to stay at Torloisk House, en route to Iona, as the host ‘lay in bed without hope of life’ so they travelled on to Ulva. There they stayed with ‘Mr Macquarry’ [sic] the father of Sir Lachlan Macquarie, who became Governor of New South Wales in 1809. From Ulva the pair moved to Inch Kenneth where, once again, they had welcoming hosts ‘a gentleman and two ladies of high birth, polished manners and elegant conversation’. After visiting the chapel they went by boat to collect oysters, presumably for their evening meal. Back on Mull, Johnson and Boswell went to look at Mackinnon’s cave. They had forgotten ‘tapers’, but managed to get the ‘eleventh part of a mile’ into the cave to see ‘Fingal’s Table’ by using ‘one little candle’. Johnson was aware of Maclean [sic] [Maclaine] of Lochbuy being a ‘true Highland Laird’, although he was ‘rough, tenacious and haughty of his dignity […]’. A moment of potential embarassment arose when the Laird asked Johnson whether he was a Johnstone of Glencoe or a Johnstone of Ardnamurchan. It was left to Boswell to explain that he was ‘not a Johnstone but Johnson, and that he was an Englishman’! When the travellers stayed at Lochbuie it had not been long since the family had moved out of Moy Castle and into the more modern ‘mansion’ nearby. Even though this house was newly built, only some forty years afterwards the Maclaines built the Lochbuie House we see today. The old house remains in the square where it has a blue plaque reminding visitors of the visit of Johnson and Boswell.